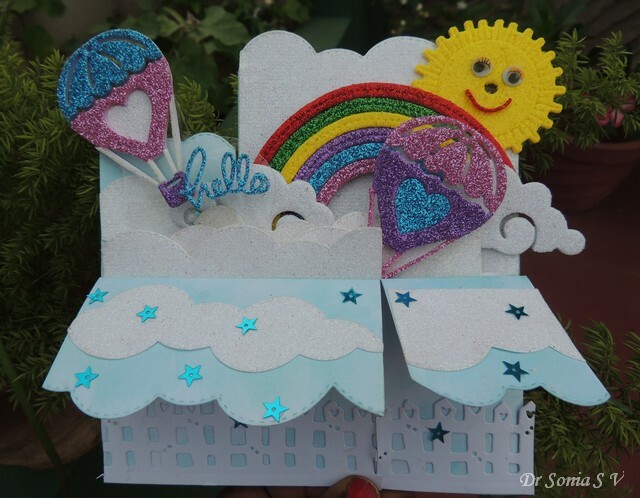 Hi friends, with nature's forces playing havoc at many parts of the world including Mumbai ,in India....I would like to share a card which echoes the sentiment "May the Sun shine brightly and bring cheer". 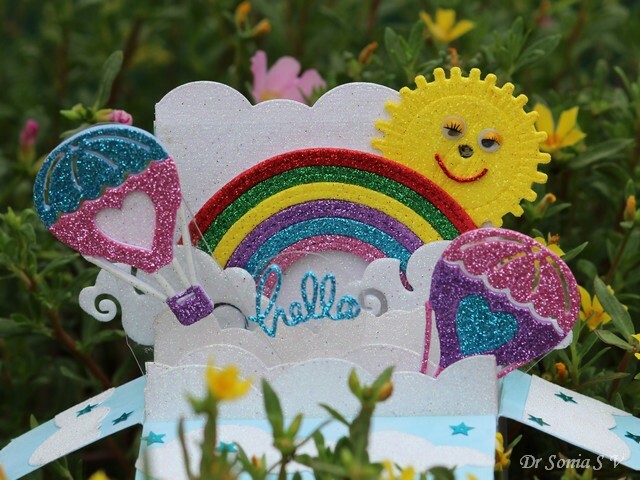 This Pop Up Card has multiple layers of sparkling clouds, cheerful hot-air balloons floating up in the sky [on acetate strips] and a gorgeous sparkling rainbow! I went an extra bit in this one and made the Sun light up on pressing one cloudy corner! I wanted to convey that no matter how cloudy and gloomy the scene is , the sun always comes up! LED Lights - I used Chibitronics sticker LED lights as these are adhesive backed, tiny ,lightweight, come in various colors . If you dont get these in your country you can always use regular LEDs but they will be bulky and trickier to use. 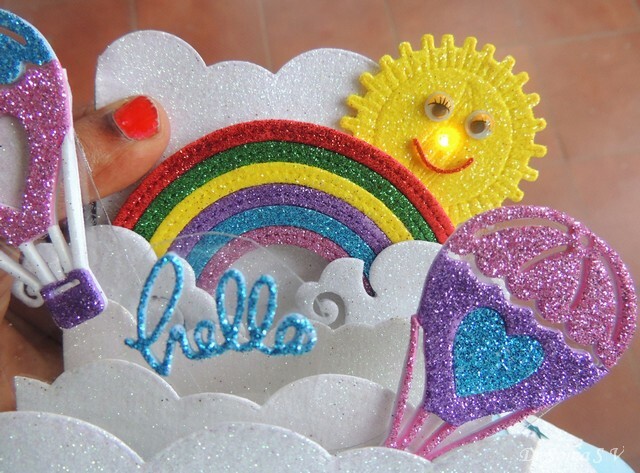 The Chibitronics LEDs being fairly flat and tiny make them ideal for paper-crafters and you can even use a couple to light up a card or layout! 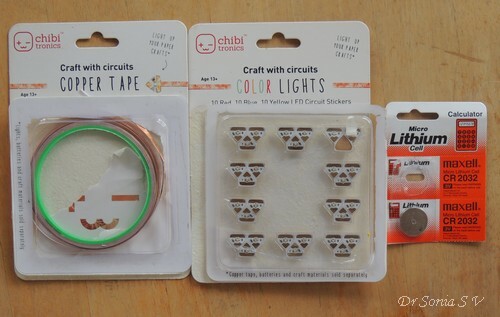 Conductive tape - I used Copper tape by Chibitronics as I decided that other electrical conductor options like aluminium foil and bare wire would be too tricky to use though technically they would work! 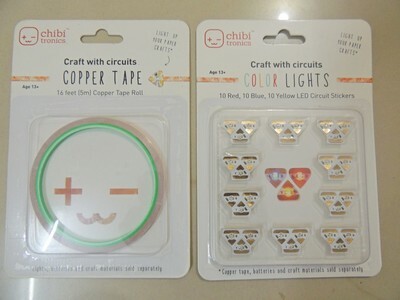 This particular copper tape is adhesive on one side so ideal to use in paper-crafts and can be cut with a scissors or even be torn with your hands! Battery for the LED - I used a Micro Lithium 3V cell battery I picked up from my local electrical shop. 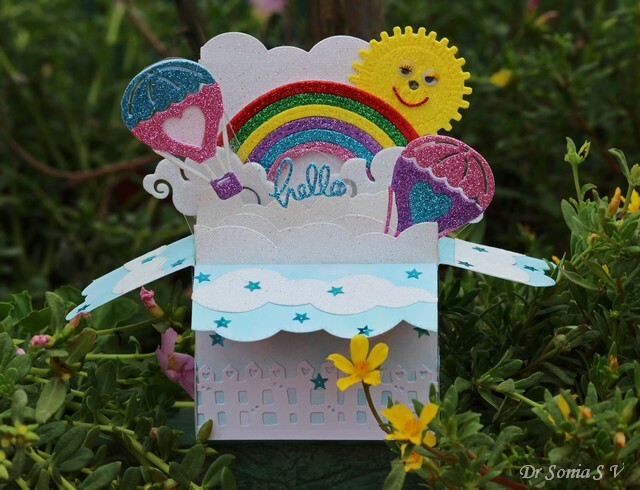 I have a video Tutorial showing the basic steps on how I made the card. It is not as detailed a Tutorial as I usually do as it was very tricky to photograph the circuit making steps so do forgive me ! 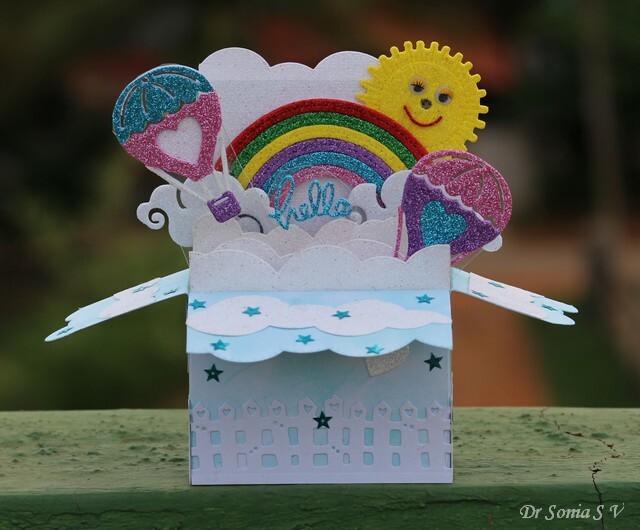 The Pop Up Card folds flat for mailing but I think I would rather hand deliver this special card as I would love to see the recipient's reaction!! I would like to especially thank all my crafty blogger and social media friends who without knowing have helped me see the sunshine on many a cloudy day! Thank you !! 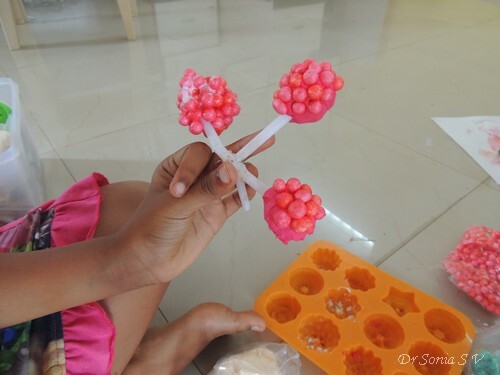 In my daughter's school, the teachers don't stress out the kids by giving marks or grades for projects and that I guess makes it all the more relaxed and a fun learning experience for the children! 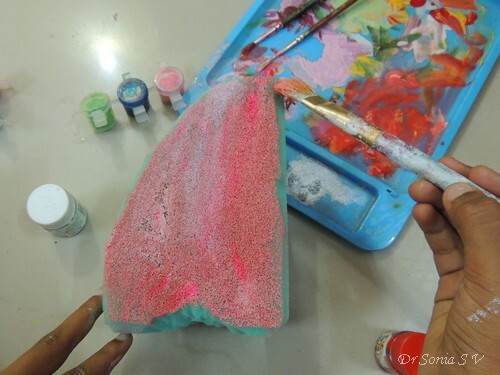 My daughter loves to make 3 D models and dioramas for her school projects and really likes to put in a lot of work! 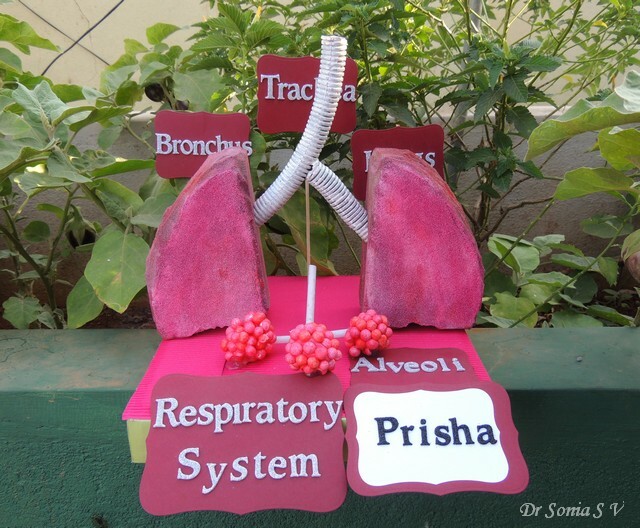 Though the topic was respiratory system , we decided to just concentrate on the parts beyond the trachea! 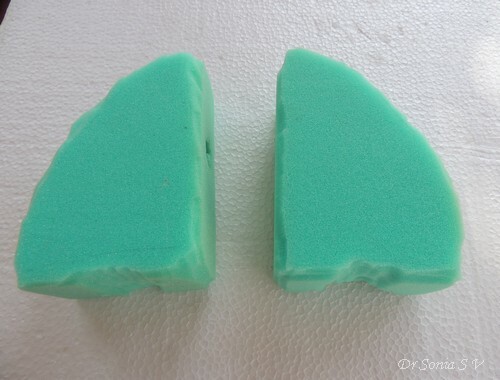 We used big sponges to make the lungs and used regular scissors to snip off the excess sponge and shape it. 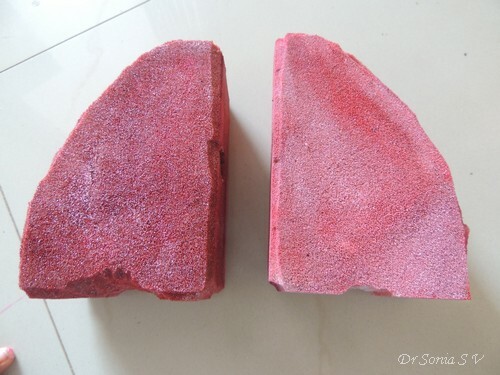 Our lungs are actually life size though simplistic in shape! 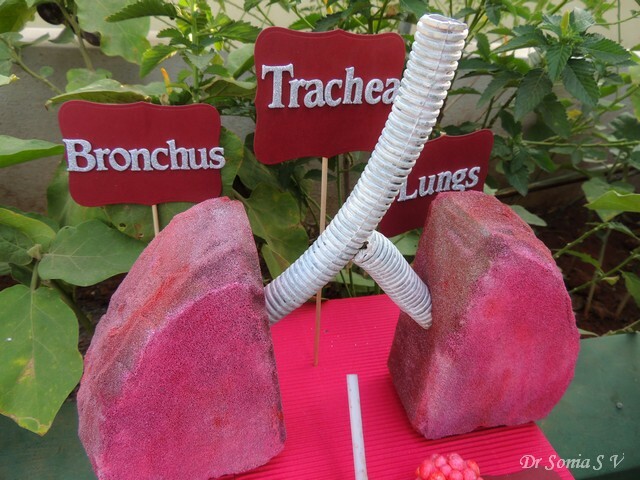 There was some flexible plastic piping at home and this was perfect to make the trachea and bronchi and it was also helpful to explain to my daughter about the cartilaginous tissue forming these tubes! 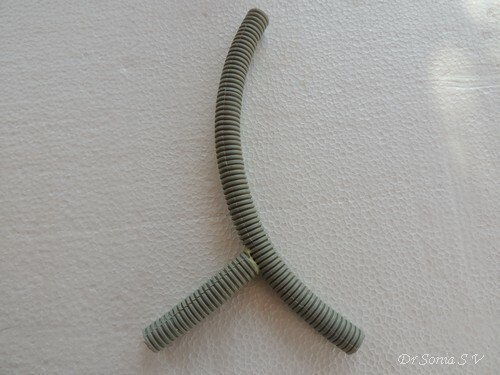 We used an adhesive called Fevibond to stick one short piece of the tubing to a longer piece and thence form the point of bifurcation of the trachea into the bronchi. 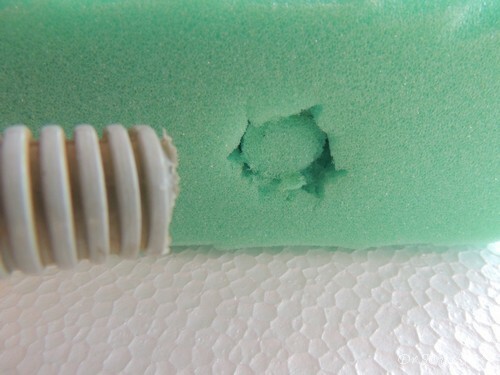 It was super easy to insert the "bronchus" into each sponge "lung" by simply twisting the pipe in and securing with fevibond glue. The part my daughter enjoyed the most was painting the lungs! 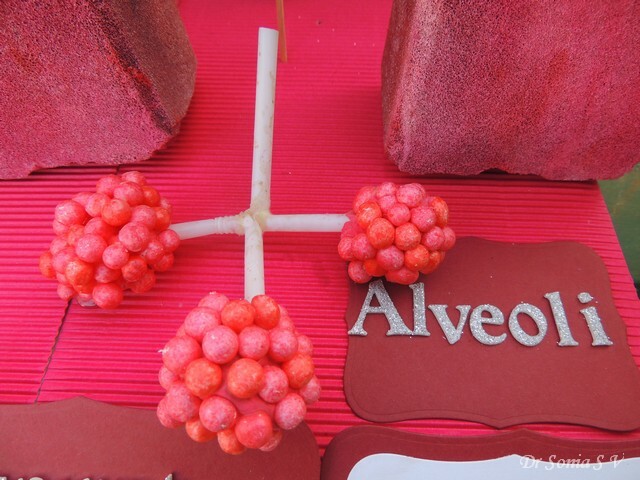 Alveoli [ tiny air sacs] are the endpoint of the respiratory system where the gaseous exchange takes place and we used tiny styrofoam [thermocol] balls and light weight air-drying clay to make the bunches of alveoli! 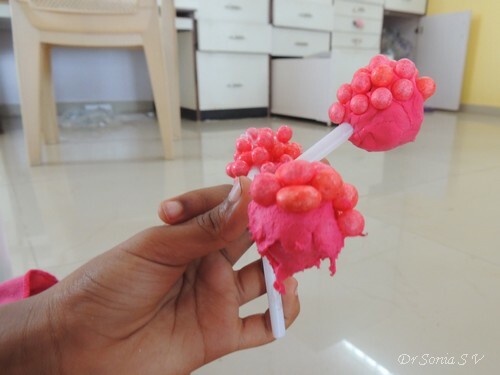 We used plastic straws to make the " bronchioles" which led to the alveoli, poked the straws into balls of clay and stuck the thermocol balls onto the clay. 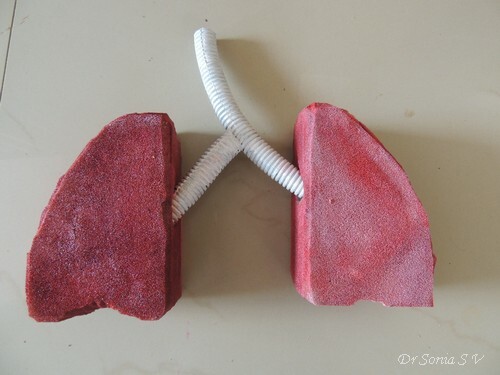 Coming back to the lungs...here are the painted lungs. 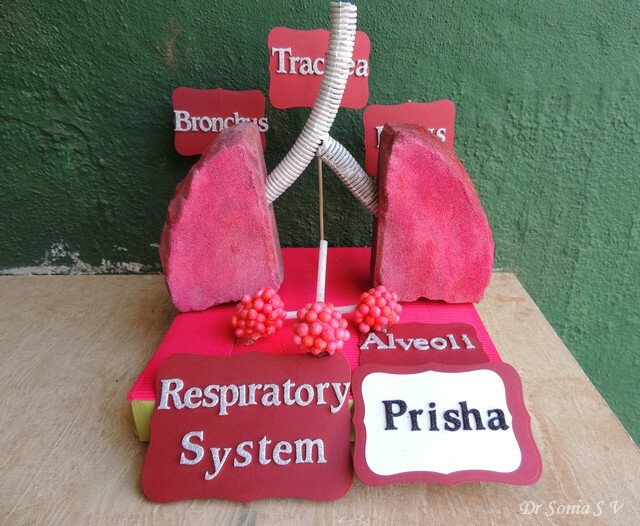 And here is the model after attaching the tracheo-bronchial tree! To add charm to the model, my daughter die-cut glitter foam letters to form labels for the parts. She was so proud that amongst all the models and charts the children had brought, her science teacher chose to keep her model in the showcase of their science lab so that junior and even senior children could see it! Hi friends it feels so good to be able to squeeze in time for crafting once again. 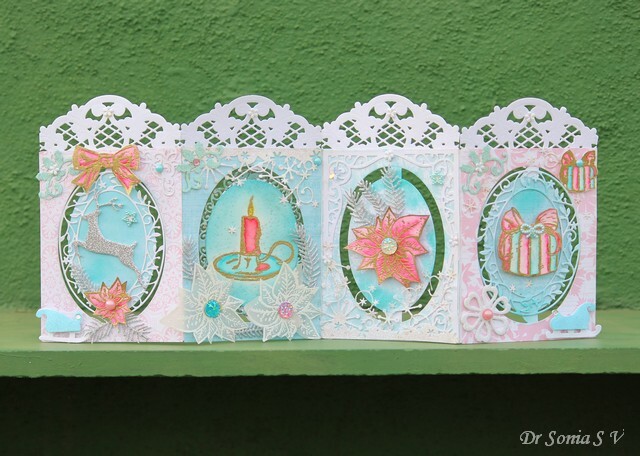 This 4 panel accordion card is my DT project for Maureen's Rudolf Days Challenge . I chose to go with unconventional Christmas colors pink and baby blue but added quite a lot of white in the form of snowflake borders[Memory Box dies] ,white lacy arch borders above each panel [ cut using Marianne dies] and 2 beautiful white poinsettias made by heat embossing poinsettias [from Rubber Dance Art] on vellum and fussy cutting them. All 4 of my panels feature gorgeous stamps from Rubber Dance Art . Though clear stamps are so popular nowadays I somehow just love rubber stamps...I feel one can never go wrong with them!! 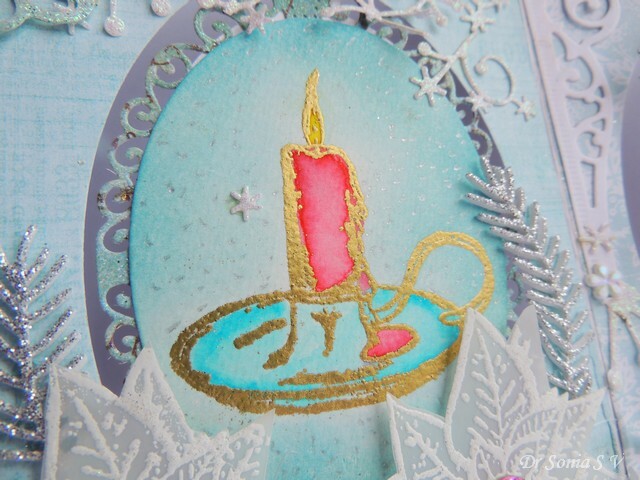 The Candle , Poinsettia , Gift Box and Bow stamps were heat embossed gold and water-colored with Zig Brush Pens[You can read more about these pens here : Zig Brush Pens Introduction and Zigs Water-coloring Tips . 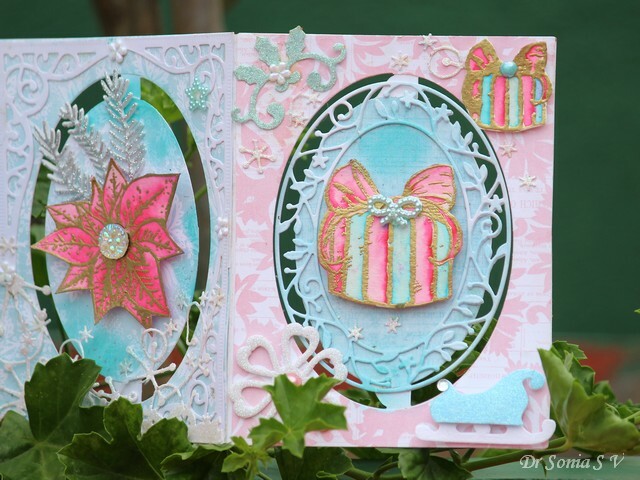 The base was made with an Elizabeth Craft Designs oval accordion die [you can see more examples here : Pop Up Accordion Cards] but I chose not to connect the central panels as I found that the cards tended to buckle over time if I did that. The 2 gift-boxes turned out soo cool but I couldn't quite capture their beauty in the photos! The leafy oval frames are from Poppy Stamps [ I just love whatever die this company makes and always lament I get only limited designs here in India!! 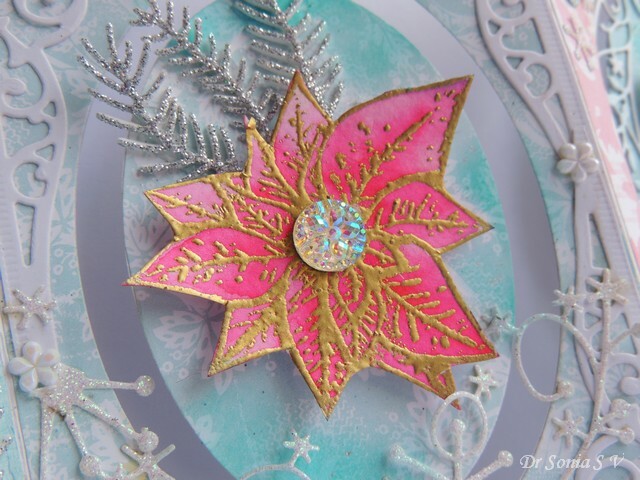 ].The gorgeous glittery pine leaves adding charm to all my poinsettias were also die cut using Poppy Stamps dies. I didnt add bulky embellishments so this card will fold flat for mailing! I hope you liked this card. 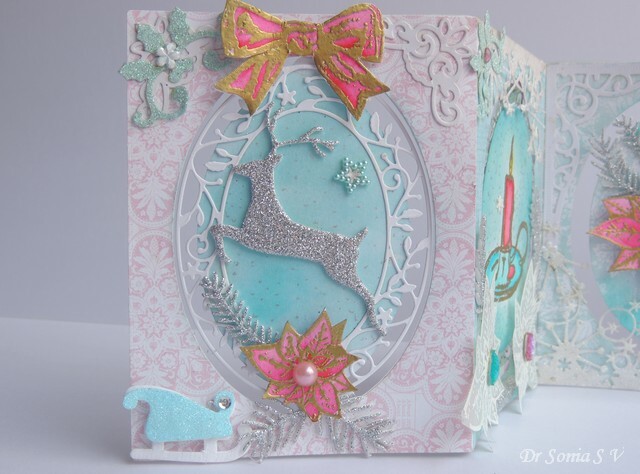 Dont forget to participate in Maureen's Rudolph Days Challenge ...the theme is always Christmas , the inspiration from the DT and the participants is always fabulous and Maureen always has fabulous prizes which she ships worldwide!! 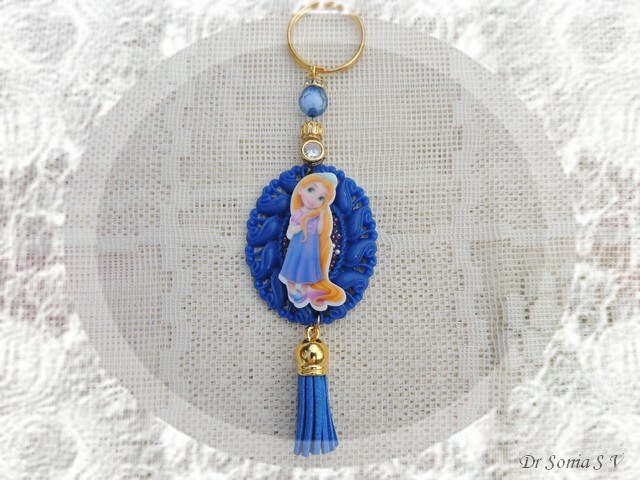 Hi friends ,the current craze in my daughter's school is bag charms ! 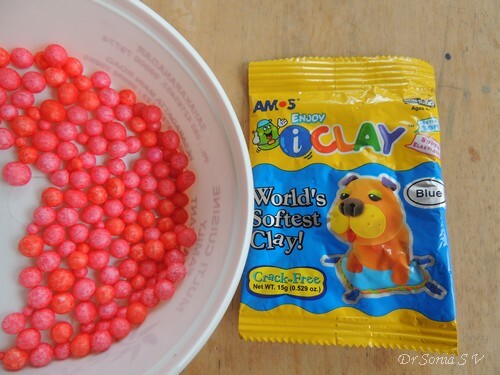 Being DIY enthusiasts we tried making our own handmade bag charms with craft supplies we had at home! 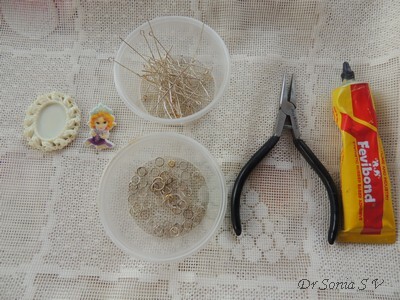 These are just the type of craft to do with hoarded beads and any cute embellishments in your stash! 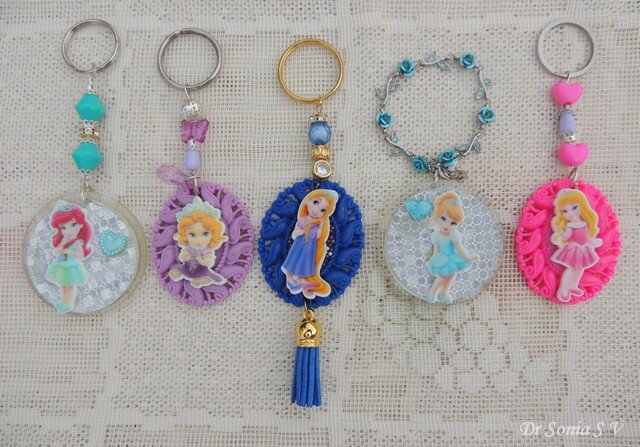 We used jewelry making supplies[long eye pins and jump rings] and resin embellishments to make the bag charms. 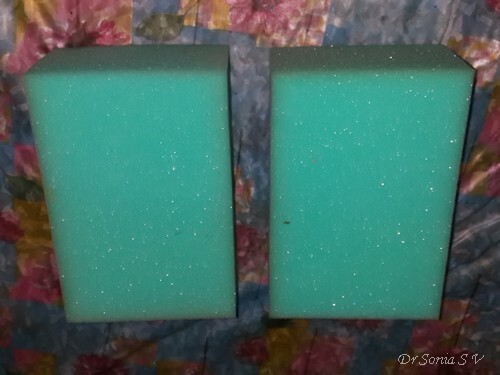 We used a local brand of adhesive called Fevibond [easy for older children to handle]to stick the resin princesses to the background frame...you can use any strong jewelry grade adhesives like E6000 also if you are making these on your own without involving children. 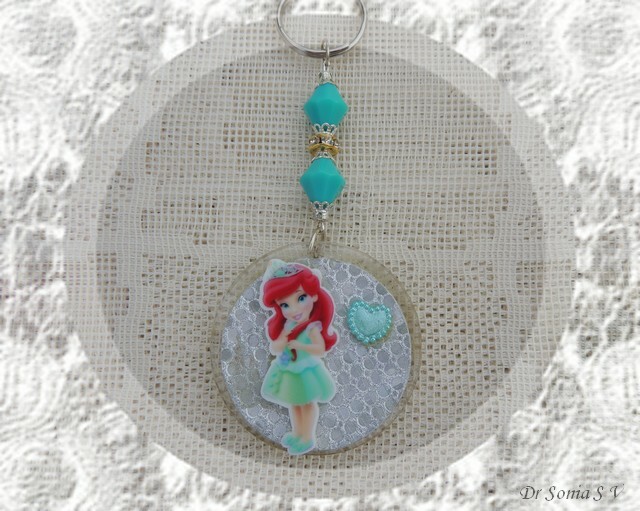 My daughter has a minimalist style and exclusively designed the 2 charms shown below. She die cut 2 sparkling circles from silver holographic paper and stuck them onto acrylic discs before gluing on the resin princesses . 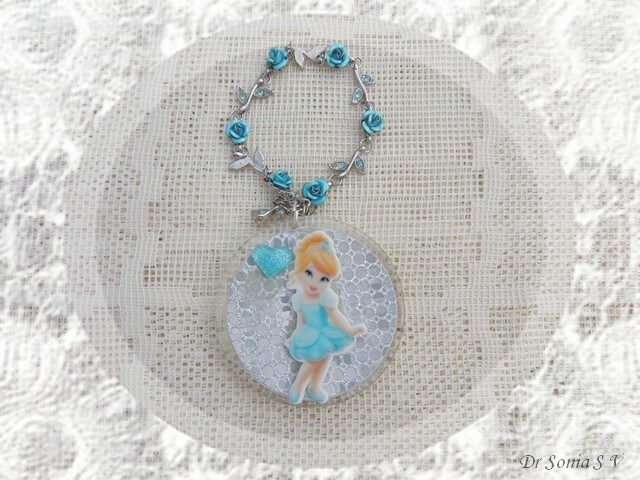 The beautiful blue rose chain on which the cute blue princess dangles is a broken bracelet!Hehe yes I am glad I hung onto this broken bit of jewelry! These bag charms are going on my daughter's school bag and purse but I just couldn't resist using one on my own handbag too!! What do you say friends...how do you like them...? 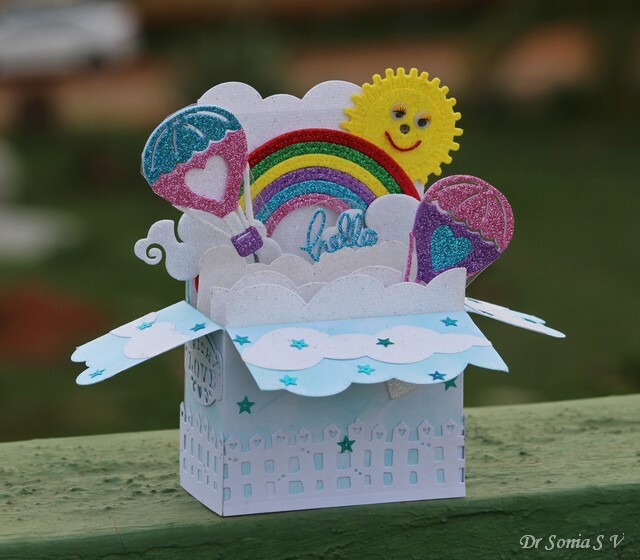 Hi friends life is slowly settling down for me and since I have been missing my blogger friends I thought I will restart blogging but not with my creation but my daughter's! 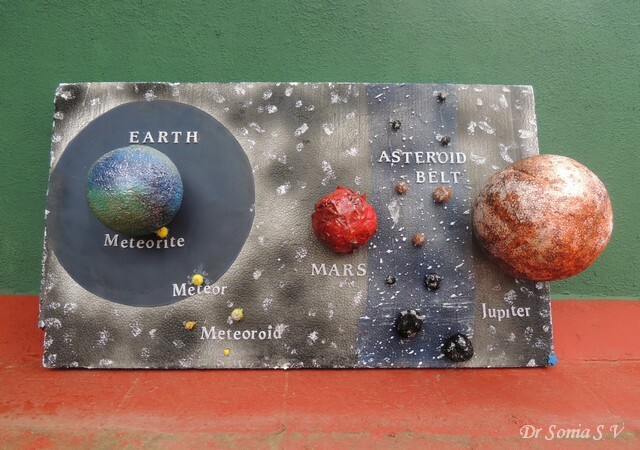 This is a school project my 11yr old made for her Geography school project on Asteroids and Meteoroids. 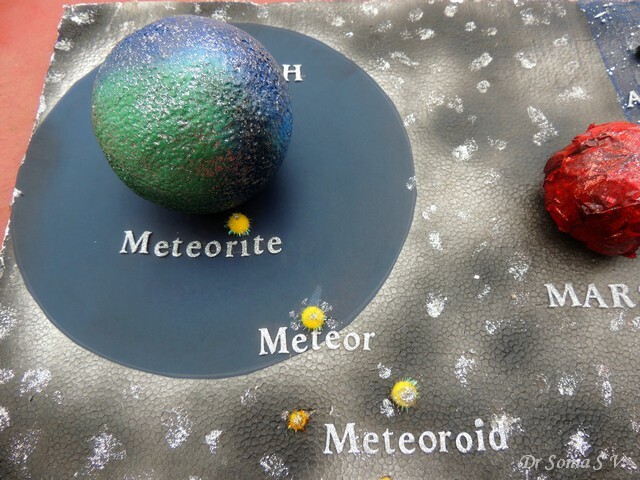 We really put a lot of paper-crafting supplies to good use to make this 3 D chart. 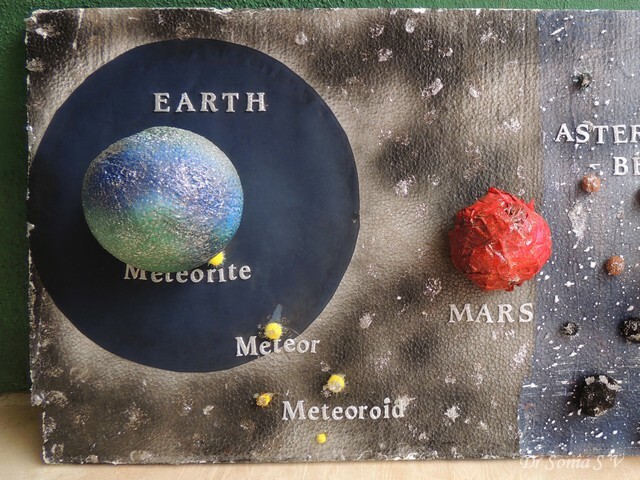 The letters were cut from glitter foam using Spellbinders dies and spray paints and glitter glue came in quite handy to create the planets and other celestial bodies! 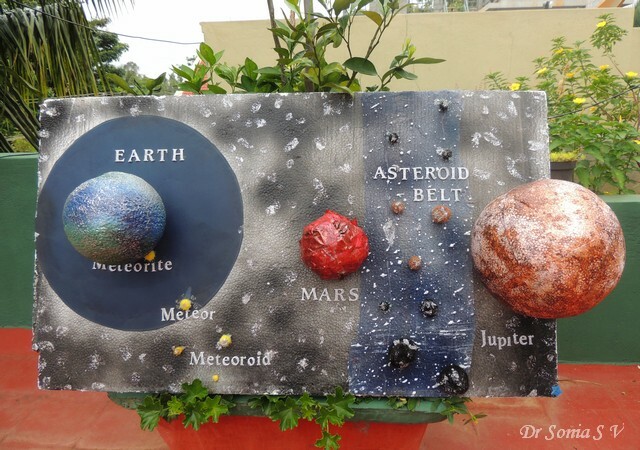 The base of the 3 D chart is a sheet of thermocol painted in a splotchy manner with black spray paint and glittered up with patchily with sparkling silver glitter glue! 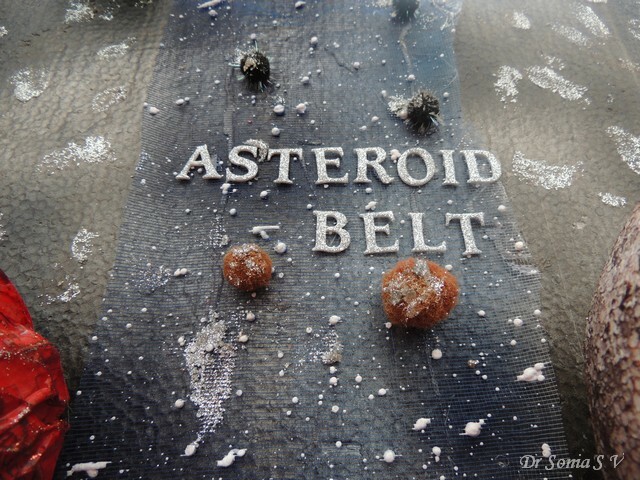 The "Asteroid belt" between Jupiter and Mars has modified "pompoms" made sparkly with generous helpings of silver glitter glue! 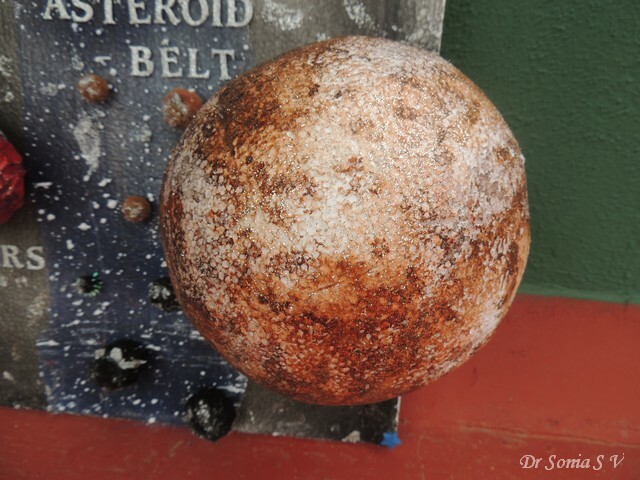 Jupiter is my favorite...love how the splattering of paint and the glitter glue gives it a misty,shimmering look! 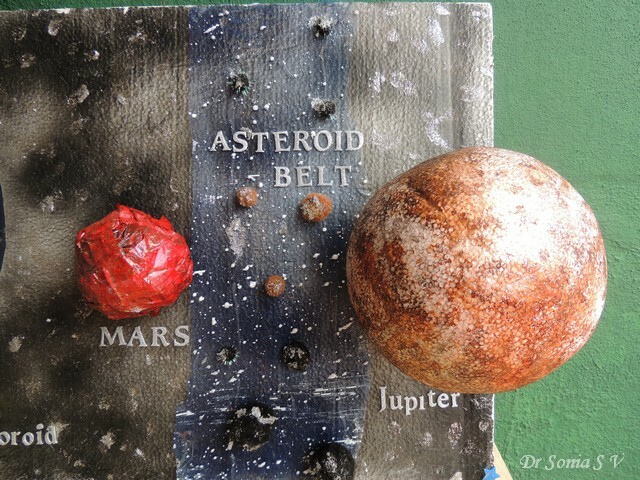 And in the photo below you can see the closeup details of the Asteroid belt! My daughter was so proud of her model and I think for a long long time she will remember about this little topic in geography ! I will be visiting you all soon! I sure did miss my blogger pals! 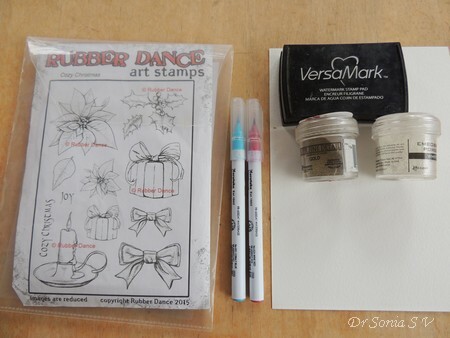 2.Simon Says Stamp Wednesday Challenge - Splatter it.